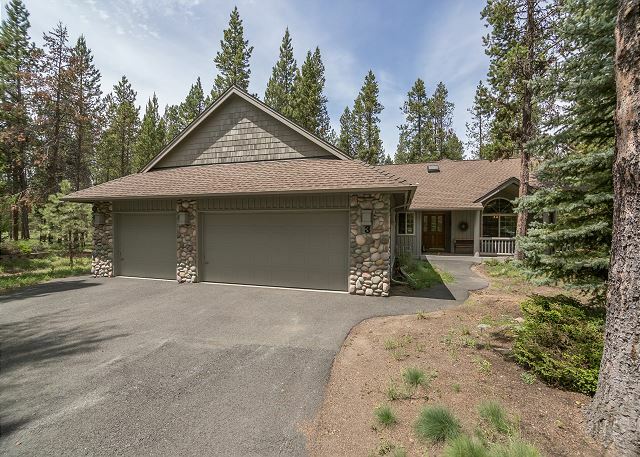 Umpqua 3 is an amazing one level home with open floor plan for easy entertaining at home and 10 unlimited SHARC passes for fun filled sunny days in Sunriver! 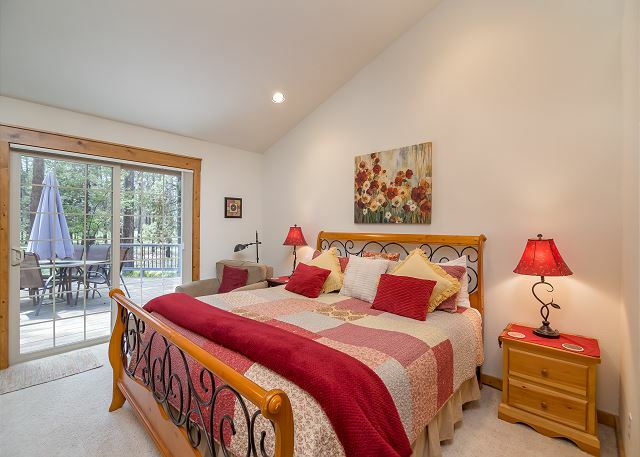 This modern, updated, four bedroom, Sunriver vacation home has two beautifully appointed King Master Suites each with its own bathroom, a Queen bedroom and a bunk room with a set of log full sized bunk beds that would be perfect for multiple families. The bunk room is equipped with its own flat screen TV equipped for video games, VHS and DVD. There are additional sleeping accommodations for two in the living room on a hide-a-bed. For the younger family members, Umpqua 3 is equipped with a high chair, crib and baby bike trailer. 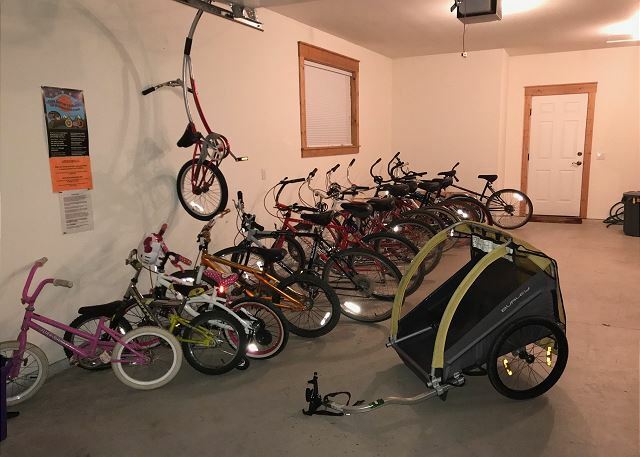 Speaking of bikes, Umpqua 3 features an entire fleet, with road bikes, cruisers and kids’ bikes all ready for the 33+ miles of paved bike trails in Sunriver. The owners of this home have put meticulous thought into the details of their home for traveling families and have left no expense spared. Entertaining in Umpqua 3 is ‘foodie approved’. 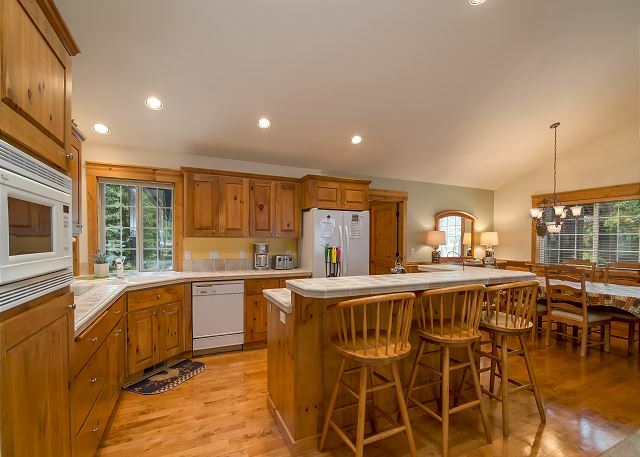 The wide open floor plan accommodates breakfast bar dining for four and formal dining for six people. 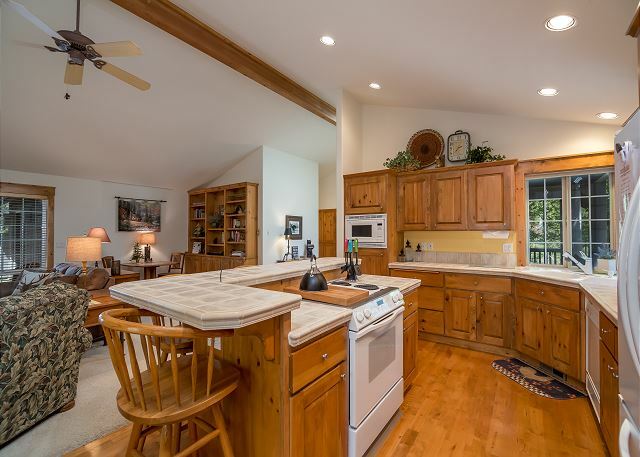 The fully equipped kitchen is stocked with plenty of bake ware, serving dishes and cooking utensils. There is propane BBQ on the back deck along with deck dining for six people. 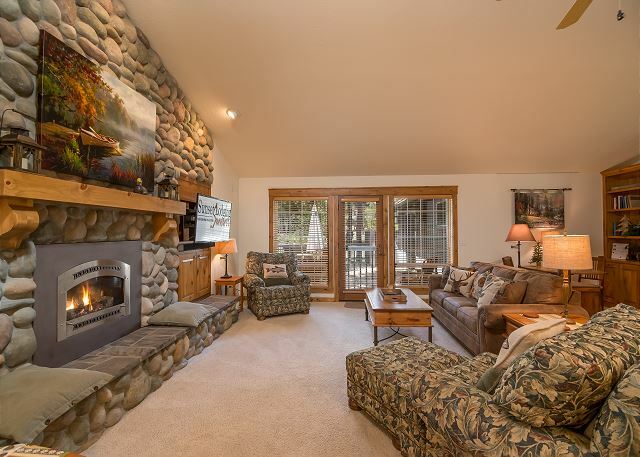 With a spacious, open floor plan, you can prepare your meals and watch the game on Umpqua 3’s giant flat screen TV in the living room, fully loaded with upgraded sports channels. If cooking in isn’t your thing on vacation, Sunriver offers a host of fine dining and casual restaurants. Central Oregon is becoming widely recognized as a ‘foodie’ destination and rightfully so! You won’t find a more extensive selection of craft beer and wine paired with locally grown farm-to-table food than you will in Central Oregon. 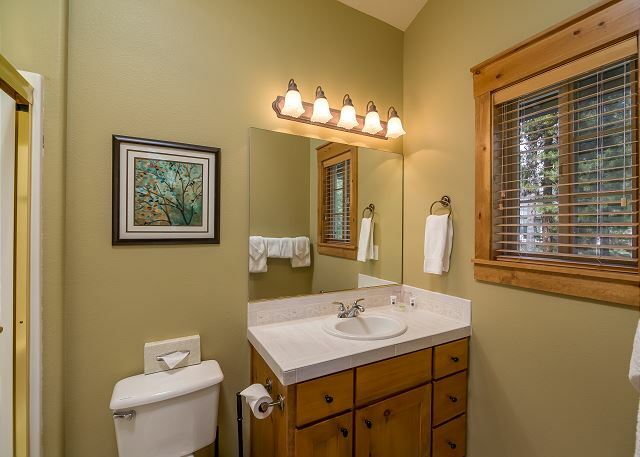 Umpqua 3 provides all of the amenities you’d expect from your Sunriver rental home and much more. 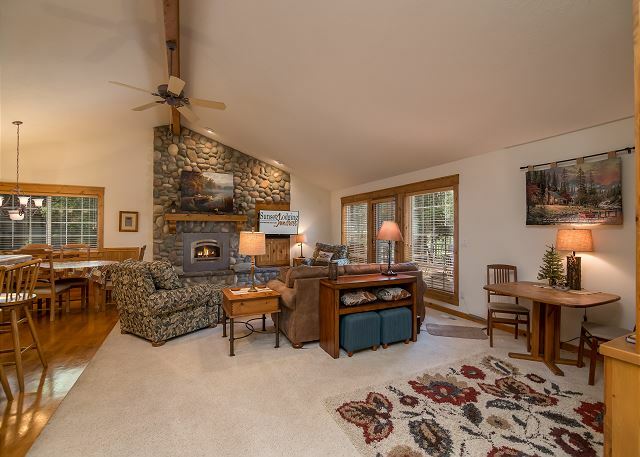 Enjoy the stars from your private hot tub, gather the family around the cozy fireplace to celebrate the holidays, or build your Sunriver memories in whatever way your family celebrates vacation. 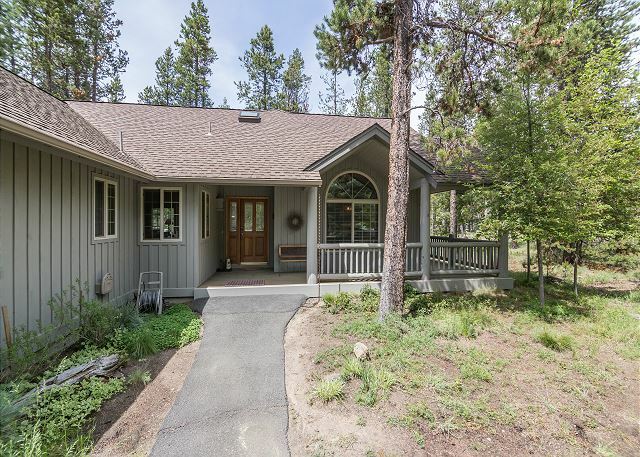 Umpqua 3 provides the perfect home base while you explore beautiful Central Oregon. Relaxing, enjoyable place to spend the holidays with friends and family. Thank You for the wonderful 5 star review, Larry! We are so glad that you had a fabulous time in this relaxing and enjoyable home! Come back Soon! What a wonderful vacation! Not only was the house beautiful, but the amenities were great. The hot tub. The huge selection of bikes. The proximity to bike trails. Really great. So comfortable as well. Thank You for your 5 star Review, Jay! So happy to hear that you enjoyed the home and it's amenities! Come back Soon! Thank You for the 5 star Review, Michael! Umpqua 3 is a wonderful location and we are so glad that you enjoyed it again this year. Hope to see you again for a 3rd! We loved the location of this house near family on white elm. House was exactly as described. One thing I would consider is more living room comfy seating. For a house that sleeps so many, there was only comfy seats for 5. Another couch or loveseat would have made this house perfect. Thank You for the 5 Star Review, Coleen! We hope to see you in Sunriver again soon! This was our 2nd time staying at this house. The place was clean and neat and had all the things we needed for our group. Thank You for the 5 star review, Robert! Umpqua 3 is beginning to have a following as it is just so unique and leaves nothing to be desired. Hope to see you again at Umpqua 3! We enjoyed our stay, thank you. Thank You for your review Sarah! We hope to see you again soon! Thank you for your glowing review of Umpqua 3. We're glad you and your family had enough room to spread out and play. We look forward to welcoming you back to Sunriver soon! Very clean. Kitchen has everything. Living room was perfect. Loved the location. Very private. Our family had a wonderful Christmas. Thank you! We're so excited to hear that you enjoyed your stay at Umpqua 3. We always love to hear positive feedback and look forward to welcoming you and your family back to Sunriver soon. Thank you for staying with us at Sunset Lodging in Sunriver! WE HAVE RENTED ANOTHER PROPERTY BEFORE AND HAVE ENJOYED OUR STAY EACH TIME. Thank you for choosing to stay with Sunset Lodging in Sunriver. We're very pleased to hear you enjoyed your stay this time and during your previous visit. We hope you'll stay with us again soon. See you in Sunriver! We had a wonderful time. Great house. Thank You for your review! Umpqua #3 is a wonderful place to enjoy Sunriver and we are glad that you had a great time! Come see us again! Great house for two families with kids and pet(s). Well stocked kitchen and lots of nice touches around the house, such as lots of throw blankets and pillows. A bit far on bike to the village but still very doable for active people. There seemed to be lots of bikes but after trying them out, half seemed unridable because of loose handlebars, flat tires etc. We brought some bikes, so not a huge concern for us. Probably the biggest bummer was the no AC. which can be okay most weeks but we had numbers hitting 100+. so that was rough in the early evenings. We kept the house closed up during the day but around the dinner hour it was hot. We also brought fans because we are veterans to Sunriver in the summer months and know that most houses dont have AC. Im sure glad we did because they didn't have enough fans. All-in-all we did enjoy our stay there and would probably stay again if we didn't find a house wth AC in a better location. Thank you for your review Lori! We will checkout the bikes and apologize that they were not all in good condition. Our bikes get a lot of use over the summer months and we will be sure to check on those. I will also pass along your message to the owner about getting more fans for the home, we did have a very hot summer this year. Umpqua #3 had everything we needed for an amazing vacation. The home is well stocked including more than enough bicycles. My grandson learned how to ride a bike on our first day there. The location fit our needs so well having a long driveway and quiet neighborhood so the kids could ride their bikes. We enjoyed the hot tub many nights and we used the free Shark passes during the day. 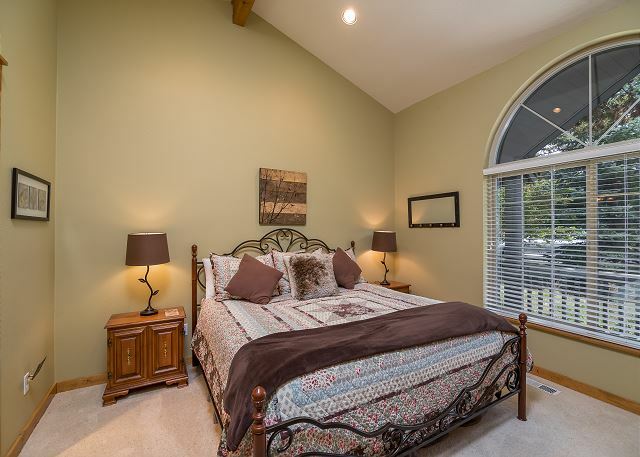 The spacious home with two master suites was a bonus. Thank you for a wonderful stay. Thank you for your review Nola. We are so glad you enjoyed your stay with us at Umpqua #3! 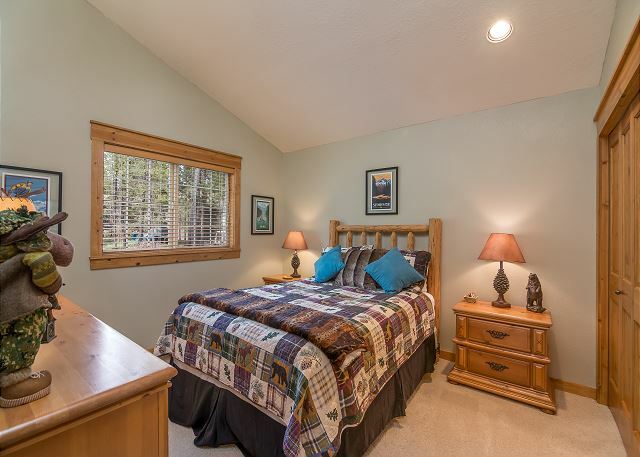 Glad we could help provide some memories for you and your family while in Sun River. Hope to see you again soon! The vacation home was quite nice with a well stocked kitchen, very nice bedrooms, and an outside deck that everyone loved. The kids had a good time at the water park and enjoyed the many bikes to use. The weather was very good and that made the whole vacation very nice. Sounds like a great stay in Umpqua 3. We are so delighted that you enjoyed it and we hope to see you again soon. Thanks so much for the great review! Oh there WILL be a next time! 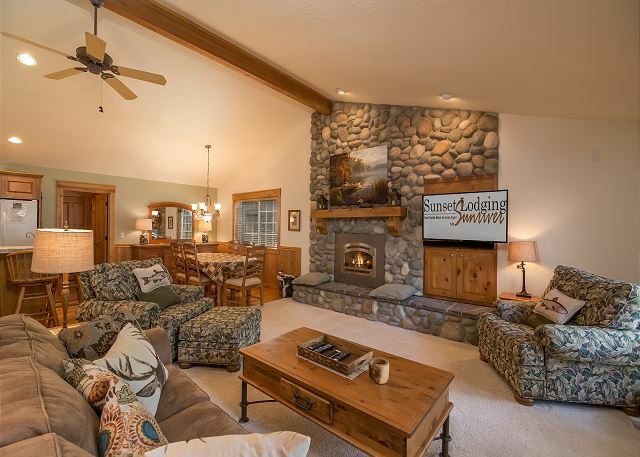 We recently took a short weekend trip to Sunriver and stayed in Umpqua 3 - we LOVED this house! it was perfect for the 3 families that came all together and we honestly couldn't have asked for a better home. the location was perfect and all amenities were exactly what we could have asked for. we enjoyed the bikes, the SHARC passes and who wouldn't love the view from the back deck of the countless stars above. our vacation was TOO short and we WILL be back - and will definitely rent again through VRBO! Thanks for the wonderful review Adrienne! We are so happy that you enjoyed your stay. Just as an FYI, if you book with us direct, you wont pay booking fees, but either way we are so happy you enjoyed your family trip! This house is Well Stocked !! Was perfect for us and our 2 adult children one which is married with 2 children. The bikes that are provided are Incredible. Other than a chain slipping off, they are in great shape. Very clean and good location. Thanks for the great review Wilma! We truly appreciate your feedback and hope you come visit us again soon! THIS HOUSE WAS PERFECT FOR OUR FAMILY REUNION. THE WEATHER WAS BEAUTIFUL, SO WE WERE ABLE TO USE THE DECK AND HOT TUB. WE HAD SOME PEOPLE THAT HAD HANDICAPS SO THE ONE STORY FLOOR PLAN WAS WONDERFUL. THE HOUSE IS BEAUTIFUL. VERY CLEAN AND KEPT UP TO DATE. I AM VERY APPRECIATIVE THAT WE WERE ABLE TO STAY AT 3 UMPQUA THIS YEAR. HOPE WE WILL BE ABLE TO STAY HERE IN THE FUTURE. Hi Sharon, We are so thrilled that you had a great time at Umpqua #3. Thanks so much for the great review! We hope to come stay with us again! We loved our stay at your house on Umpqua lane. We will be back next year for sure! Hi Darren, We are thrilled to hear you enjoyed your stay in Umpqua #3. We will see you next year in Sunriver! Thanks for choosing Sunset Lodging! 2 families shared the home at Umpqua 3 and we were impressed. The home was clean, decorated so tastefully (the kitchen is stocked with nicer dishes than I have at home) and the floor plan was perfect! Loved all the bikes! Kathy, we are thrilled you had such a wonderful time in Upmqua 3. What a wonderful review! Please come visit us again soon in Sunriver! We spent the Christmas holidays here with two other couples. We arrived on Christmas eve to a beautifully decorated house and several feet of snow. It's a great location for getting to the ski slopes at Mt Bachelor and restaurants, the Ale Trail, etc. in Bend. And for non-skiers, lots of walking trails. And amazing views of the Milky Way! The house is very comfortable. It easily accommodated 3 couples. And the kitchen is well-equipped. We cooked almost every meal there, including Christmas dinner. We had a problem with the water heater one morning, which was fixed promptly. SO glad ro hear that you enjoyed one of our allstars, Umpqua 3, Cyndy! Since that home came into our program, it has been a HUGE hit with our guests. We're so glad to have had the opportunity to host you for your Christmas in Sunriver, and we hope it is a tradition that you will continue for years to come! 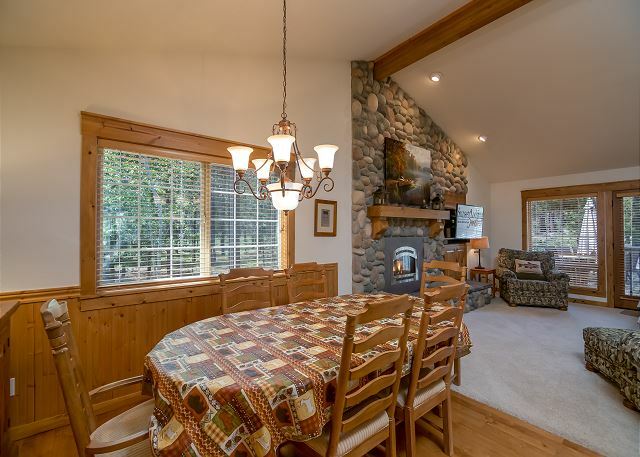 A very nice home to vacation, relax and bring your dog! 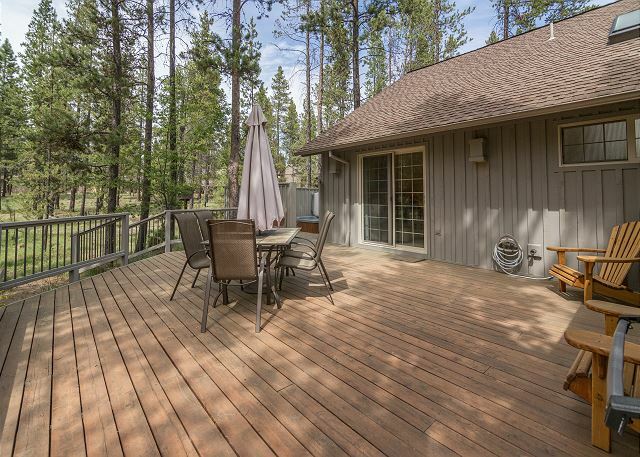 Also a beautiful and private deck to read a book, get some sun, play cards or have a family meal. We had a great time during our annual Sunriver Summer Vacation. Umpqua #3 was an ideal place for the adults, children, and our dog. The location at the end of the street was in a very nice location. 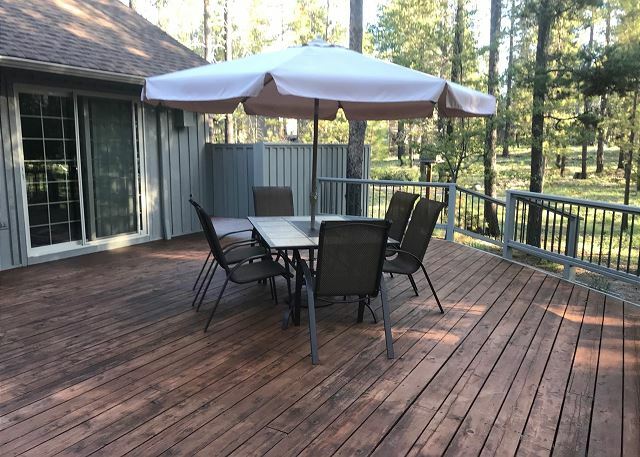 The backyard deck was perfect for barbecuing, family meals, and just relaxing and enjoying the forest view - without having other homes immediately adjacent. The front of the house was quiet and very little traffic - a nice location teaching the young children to ride bikes. This home will definitely be on our list to return to for our next year's vacation. The home was beautifully decorated for the holiday season. We had fun looking at all the details. The home was pristine and furnished perfectly. 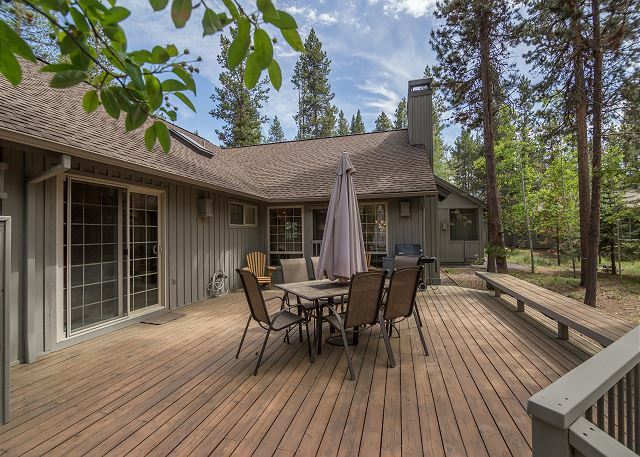 It has everything you'd need and want for a perfect vacation in Sunriver. 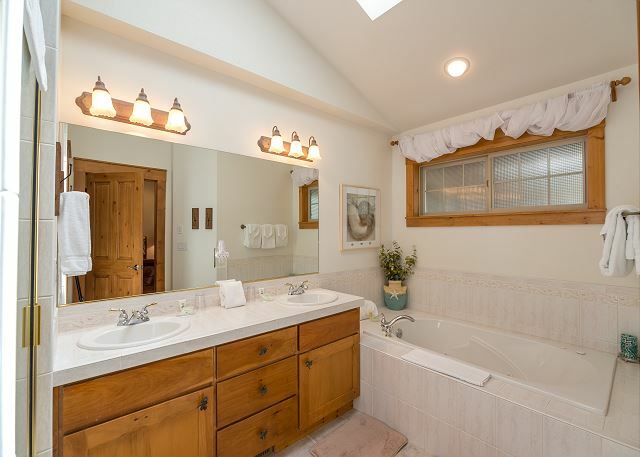 The house and kitchen were spotless when we arrived and the hot tub was ready for use! 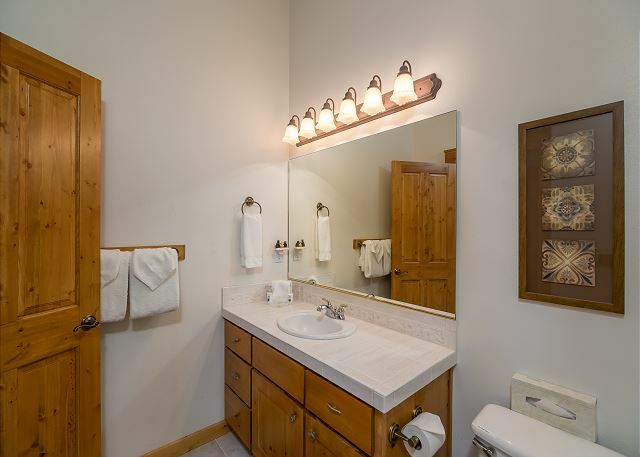 Attention to lots of details that many rentals over look - like ample hot tub towels, dog blankets, lots of things to cook in and store leftovers. Felt like a home, not a rental. Loved it. Only downfall was that our suburban would not fit in the garage with the ski carrier on top. This was a wonderful home!! All kitchen gadgets were new, carpet was very clean, bedding was super soft and smelled great. Owners were wonderful to work with and we will definitely stay here again. We had 12 people stay at this location and it was very comfortable. Thank you! Thank you for this great feedback Jessica! I could ramble on all day about the level of detail and the effort expended by these owners to to be sure their guests are happy. We (as a team) fully recognize and embrace the opportunity that we have, everyday, to make a lifelong memory of Sunriver for our visitors. It looks like we may have you hooked!! We hope you'll get back to Umpqua 3 soon, we have very, very high hopes for this property and fully anticipate lots of 'regulars' developing soon as it is brand new in our program. Thanks again for your feedback, Jessica! !